Even if the movie wasn’t the biggest smash hit of the year, the way it should have been, Mad Max: Fury Road has certainly taken the prize for the film with the largest permeation on the internet. The number of essays and articles written about George Miller’s post-apocalyptic, people-driving-in-a-straight-line action film became a must-see for fans of cinema and discourse about gender roles, internal politics, and blind devotion. It’s also precipitated all sorts of awesome DIY projects, par exemplesome Mad Max Power Wheels. The newest and, we admit, most absurdly awesome of these projects are custom-made (and totally unofficial, via artist Kelsey Wailes) Mad Max: Fury Road My Little Pony figurines. That’s right, two weird worlds that are even weirder together. 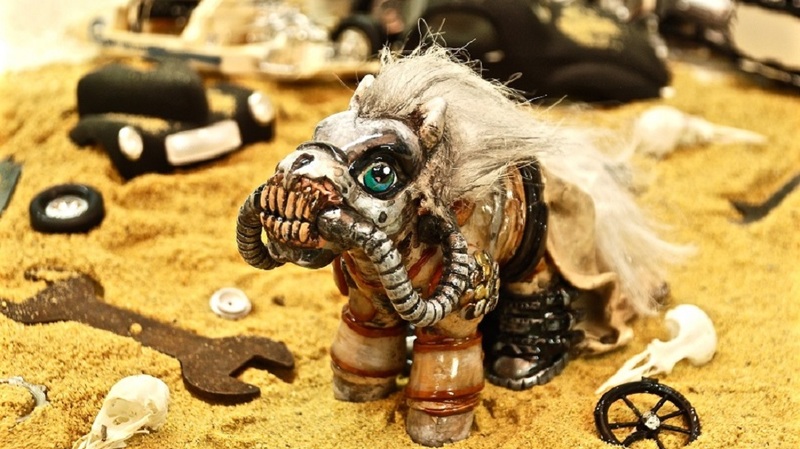 The artist used the older variety of My Little Pony dolls, from prior to the Brony days, and Polymer clay, acrylics, leather, and faux fur to create highly-accurate equestrian representations of Max Rockatansky, Imperator Furiosa, Nux, and Immortan Joe. They look so happy together, don’t they? Both the Nux and the Max figures had heads that could rotate, but all four figures have the ability to drive cars (not true). I don’t know which is more impressive — Joe’s toothy face mask/breathing apparatus or Furiosa’s mechanical artificial hoof. They somehow even managed to get the look of pure chrome-fueled martyrdom in Nux’s eyes, although I seem to recall that’s just how My Little Ponies looked anyway. The figures were available for sale at last weekend’s Awesome Con in Washington, D.C., so unfortunately that’s over, but you can still witness them in their full glory in the gallery below. Mad Max Fury Road Ponies: Because I am a monster. Made with My Little Pony toys, Polymer clay, acrylics, leather, and faux fur.